Stressed? Whether it's holidays, the weather, or just the same old tensions, you know that stress has an effect on your well-being. Of course it would be great to be able to motivate yourself to meditate, do a yoga class or another venture that promises an effective retreat from daily stresses. What about taking a deep breath? Many experts suggest simple deep breathing exercises for both immediate stress relief – as well as deep, lasting physiological benefits. Breathing exercises create positive changes that help improve severe conditions such as asthma, chronic obstructive pulmonary disease and heart failure. 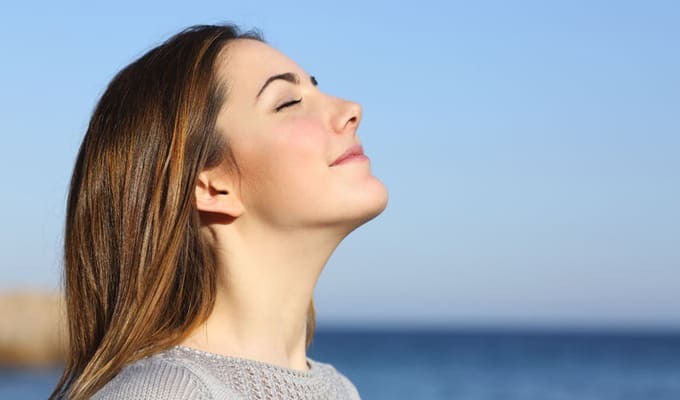 Breathing exercises enhance lung function by “stretching” the airway tissue and inducing the release of a “protective chemical” known to maintain the integrity of the airways. Deep breathing also diverts control of the body’s sympathetic nervous system and parasympathetic mode, a healthier and calmer state in terms of overall general well-being and biochemical balance. This restriction of stress hormones such as cortisol, in turn, preserves the immune function of the body and keeps blood pressure and heart rate under control. Deep breathing may also affect the gene expression related to inflammation, oxidative stress, and cellular metabolism. The longer you practice deep breathing, the more pronounced the benefits for any particular condition and for gene activity. How can we make it work? While experts describe respiratory breathing exercises nearly parallel the breath work in the traditional practice of yoga, it's not necessary to take yoga to know the techniques. It’s really about trying to increase your oxygen intake and inducing the body’s relaxation response. Just get comfortable in all positions and place your hands on the chest and stomach. In order to maximize the supply of oxygen, it is important to know to breathe from the abdomen instead of your chest. Concentrate on your breathing until you feel your stomach rises and falls more adequately than your chest with each inhalation and exhalation. Breathe in through your nose, hold your breath for a few seconds and exhale via your mouth. The time it takes to exhale must be double what it is to inhale. Some suggest a pattern – 4 to inhale, 7 to hold, and 8 to exhale. Go free of other thoughts as you breathe. Do 4-8 breathing cycles 1-3 times a day. If you have difficulty concentrating solely on your breathing, consider incorporating a simple and repetitive movement or phrase. In an Italian study, the researchers asked two groups of participants to repeat the yoga mantras or part of the Rosary the Ave Maria six times per minute to match the natural circulatory fluctuations in the human system. Rhythmic recitation allowed both groups to synchronize cardiovascular patterns and increase their oxygen consumption. Both groups had a greater sense of well-being and showed favorable physiological changes. A healthy way of living does not need to feel like a punishment, burden, or deprivation. It is the succession of small steps and simple gestures. The ease of basic breathing exercises contemplates the same logic: little efforts go a long way when practiced regularly. If you do not practice deep breathing, it is one of the simplest and least demanding goals that you can set yourself. There’s no better deal out there. Share your thoughts and ideas if you have experienced deep breathing exercises.